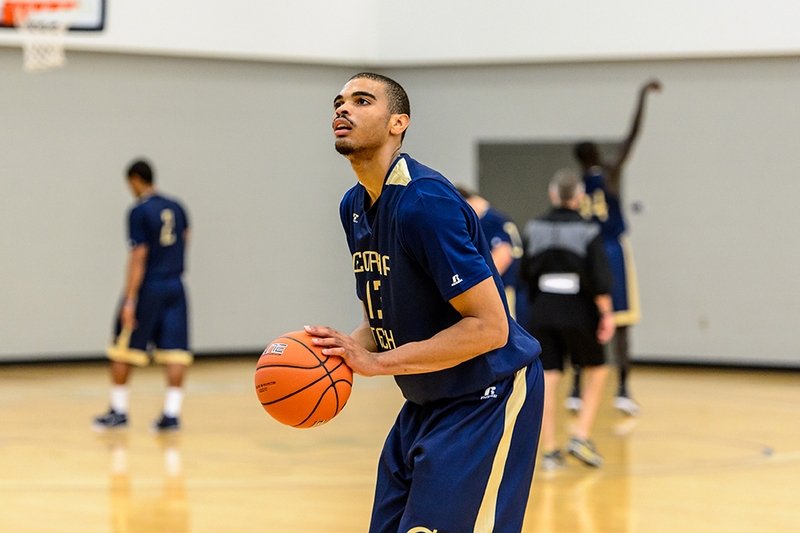 The Jackets’ men’s basketball team comes into the 2014-2015 season with major changes to its roster. Gone are Trae Golden, Daniel Miller, Kammeon Holsey and Robert Carter Jr., four key players for Tech last season. They were in the top five on the team for scoring average and in the top six for minutes played. But with Golden, Miller, and Holsey’s NCAA eligibility ending and Carter Jr.’s transfer, the Jackets have some big holes to fill. Head Coach Brian Gregory will have four returning Jackets with significant experience from last season. Junior forward Marcus Georges-Hunt, who was second on the team in points and first in minutes last season, junior guard Chris Bolden, and redshirt sophomore guard Corey Heyward are the three remaining players who started games for Tech. Sophomore forward Quinton Stephens is the other returning Jacket who received significant minutes last year. While this lack of experience may be a cause for concern, Coach Gregory has a lot more to work with thanks to the addition of three experienced transfer players. Redshirt senior Robert Sampson is one of those transfer players, and the most experienced of the group. Sampson transferred from East Carolina University, where he made 52 starts and 96 appearances in three years. He helped ECU to a CIT Championship before transferring to Tech. After sitting out a year, Sampson is eager to get back out on the court. “I’m excited to play, I’m excited for every game, and I’m excited for the fans,” Sampson said. Along with his own experience, Sampson brings along a family history in basketball. Sampson’s father, Ralph Sampson Jr., is considered to be one of the greatest collegiate basketball players of all-time. Ralph Sampson Jr. is the only player to ever win three straight NCAA player of the year awards. Sampson Jr., who is 7-foot-4, was also the No. 1 pick in the 1983 NBA draft. Sampson’s brother, Ralph Sampson III, recently played four seasons with the University of Minnesota. They were sources of support for Sampson as he watched from the sidelines last year. “[Sitting out] was rough. Definitely ups and downs. But I kept my mind focused on basketball and getting my grades right. I talked to my parents every day and to my brother, he played. Getting advice every day to improve my game,” Sampson said. The advice seemed to have helped too, as he believes he has improved in the last year. “I feel like I got in better shape in the year that I sat out. I got stronger definitely. I think I got more athletic, if that’s possible. That was pretty much my goal for the whole entire year I sat out,” Sampson said. The 6’8” Sampson is a solid rebounder, and has pulled down more than 100 in each of his three seasons at ECU, even when coming off the bench. In his last season at ECU, Sampson led the team in both offensive and defensive rebounding with 303 total rebounds, posting averages of 9.2 rebounds and 9.1 points per game. He will be called on to continue his strong rebounding, as Miller, Holsey and Carter Jr. were the Jackets’ rebounding leaders last season. Senior center Demarco Cox from Ole Miss, and junior forward Charles Mitchell from Maryland join Sampson as transfers with experience. Cox and Mitchell will not have to sit out a season and are immediately eligible to play for Tech. Along with senior Nick Jacobs, who is ineligible this season after transferring from Alabama, these three players make up a large part of the Jackets’ upperclassmen core. Despite having a short amount of time playing together, the chemistry between the three is apparent. The three players had strong showings in the annual Blue-Gold intra-squad game last Saturday. Mitchell had 18 points and 10 rebounds, Cox had 25 points and 9 rebounds, and Sampson added 10 points. There were also visible shows of support, with smiles and fist bumps among them. “We’re definitely meshing really well. We’re looking out for each other, passing the ball, standing up for each other, and getting along well,” Sampson said. This is good news for Tech beyond the perspective of just counting statistics. The veteran transfers will be relied upon for their experience and leadership as well. Sampson feels that this experience is very beneficial for the five freshman and the team’s development overall. “You tell freshmen what to do here and there since you’ve been through it three years. So, I mean, they’re definitely stepping up because I think they’re improving faster than normal freshmen would,” Sampson said. The Jackets can use all of the improvement they can get. The holes in the roster compared to last year will make it tough for Tech in the perennially strong ACC. What Sampson will bring to the team will hopefully help alleviate some of those concerns. “Be one of the leaders, attack every time, rebound, slash, and be one of the players they can count on,” Sampson said, on his role on the team. The Jackets begin their regular season with the home opener against Georgia on Friday, Nov. 14. The Jackets have beaten Georgia every year in Coach Brian Gregory’s tenure at Tech.